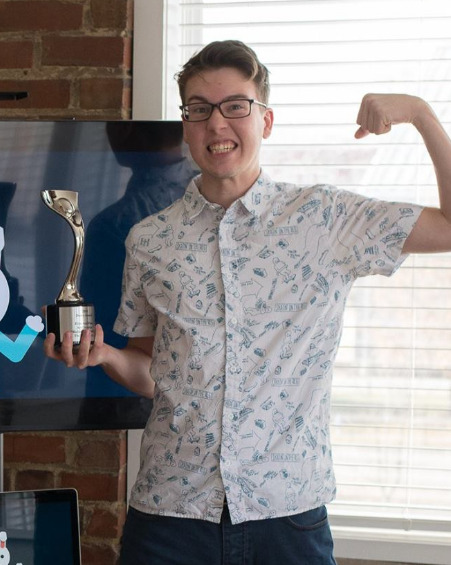 Posing with one of the two Silver Davey Awards, won by The Evoke Group for Coegi's "Richard the Rabbit" animation. My passion for art and design started at a young age. In middle school, I started making t-shirt designs for my friends and local bands. Once high school hit, I kept the designs flowing and attended the UniTec Career Center, where I dove into print design and photography. After high school, I packed my bags and moved down to Orlando to attend and later receive my bachelor's degree in Digital Arts & Design from Full Sail University. While attending Full Sail, I started freelancing and also joined No Anchor, a community of adventurers and creatives. Once graduating, I went on a month long roadtrip through the US with the No Anchor crew, exploring the East Coast and wandering up to the Northwest. I eventually found myself back in Missouri, where I ended up taking my freelancing to Columbia. Not long after moving to Columbia, I was picked up by an agency in town called The Evoke Group, where I worked as an Animation and Design Specialist. Now I'm diving back into the world of freelancing, with the plan of pushing my skills and creating art for a wider range of companies. Have you seen my work yet?